The Butterfly Trust has had another busy year in the Maskelyne Islands of Vanuatu. Lying off the southeast corner of Malekula, one of the larger islands in the Vanuatu group, the Maskelynes have all the advantages and disadvantages of remoteness. Our aim, at the request of the islanders, is to assist the 5 villages (and approximately 1500 people) of the Maskelynes to have better access to health and education services. 1. 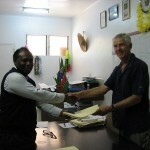 Butterfly Trust signs a joint Memorandum of Understanding with the Ministries of Health and Education of Vanuatu. In July 2011, the Trust signed a joint Memorandum of Understanding with representatives of both Ministries for an initial term of 5 years. The joint MOU with the Ministry of Health aims to facilitate the provision of medical services to health facilities in the Maskelynes. 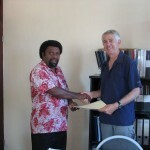 Emphasis will be placed on training new and existing ni-Vanuatu health workers. The Ministry of Education has also joined our MOU with the Ministry of Health (‘MOE’). The MOE has highlighted a need for further training of teaching staff in the areas of English literacy, science, mathematics, librarianship and school management. Read more…. Boys and girls from Year 8, Sangalai Centre School. 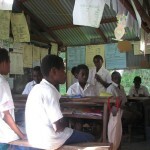 Each student will receive a school fee subsidy for their first year at secondary school in 2012. From carpentry to nursing, teaching to shopkeeping, gardening to doctoring, the Year 8 students at Sangalai also aspire to be airline pilots, mechanics and tour guides. 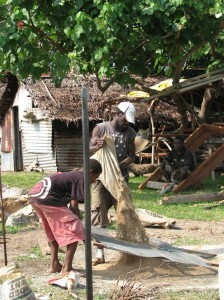 Many voice their desire to be influential in guiding Vanuatu into the future. On 4 August 2011, we were once again in a privileged position to be able to address the Year 8 class at Sangalai School. As usual, there was plenty of laughter and cheek as we coaxed them into a beautiful rendition of Michael Jackson’s “We are the world…we are the children.. we are the ones who make a brighter day….” Afterwards it was time for class photographs and distribution of a small gift pack of stationery to each student. 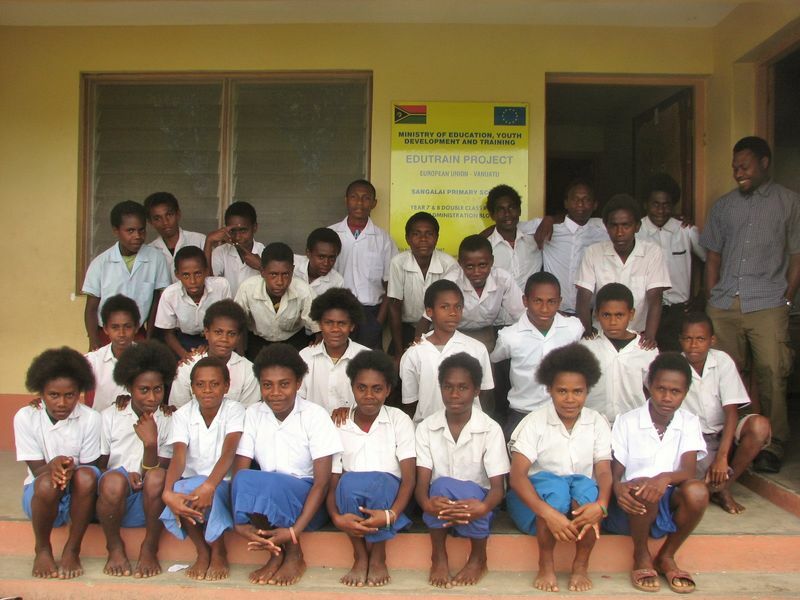 This class of 18 boys and 10 girls come from the 5 villages around the Maskelyne Islands. The majority are 14 year olds with 5 students aged 15. Only 2 in the class are in the right age group of 13 years for their level. With the tremendous support and generosity of Butterfly Trust sponsors over the last 2 years, the Butterfly Trust is pleased to report each student will receive a subsidy towards his or her school fees for 1 full term’s study at one of 3 secondary schools on mainland Malekula. Although their families will still have to fund the remaining two-thirds of next year’s fees (plus accommodation costs in the case of students without extended families in the vicinity), both students and parents alike express their gratitude to all sponsors for their gifts. A committee consisting of the trustees of the Butterfly Trust, the Head Teacher of Sangalai Centre School for the time being, the Chairman of the School Committee Board and its Treasurer will administer the funds from a trust account with the National Bank of Vanuatu. The funds will be paid directly to each secondary school at the beginning of each school term in 2012. We have asked for written reports for each student and will keep all sponsors up to date on students’ progress and achievements in the coming years. When we arrived in the Maskelynes, construction had already begun on a new teachers’ accommodation block to house new and existing teaching staff from Sangalai School. There are currently a total of 10 teachers living around the school compound with their families. Head teacher Benson Tangou approached the Butterfly Trust earlier in the year requesting financial assistance for roofing material for the new shared living quarters. A number of the old houses were rusting, too cramped and leaked in the rainy season. Not a very restful environment in which to recuperate after a long school day. 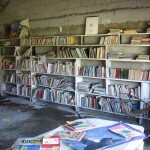 In the absence of a properly designated staffroom, some of the teachers use their homes to research and prepare lessons and to complete other administrative duties. As part of our educational objective is to help promote consistency and quality of education, the Butterfly Trust believes that a contribution towards a healthy living and working environment for school teachers will also impact positively on students. As such, the Butterfly Trust has made a contribution towards the cost of purchasing iron roofing for the new teachers’ accommodation block. The Butterfly Trust is hoping to receive a positive outcome to its application for funding from New Zealand Aid to carry out the following 2 projects.